What Is An Addi Knitting Machine? If you have been knitting for a while, you would have no doubt heard about the amazing Addi Knitting Machine. A knitting machine is a device that is used to create knitted fabrics and clothes in a semi or fully automated fashion. Using a knitting machine of any kind is far faster than knitting by hand, and owning a machine is ideal for people who do knitting for profit, knit for charity, or simply knit a lot. The Addi Knitting Machine is a cheaper version of a full-blown knitting machine, and in this review, I am going to tell you a bit about the Addi Knitting Machine and how it works. I used to own an Ultimate Sweater Knitting Machine before I got too busy with my teaching work, and I was addicted to making and selling cute baby outfits. I also owned an Empisal, but just found the smaller machine a lot simpler to operate. I would love to get back into it again, and the Addi Knitting Machine below is something I am definitely going to purchase next time my brother comes to visit from America. After having a go on my friends Addi, and seeing how easy it was to use I just can’t wait to acquire my own. The price is also great, especially if you can’t afford a more expensive knitting machine. Having an Addi Knitting Machine lets you have a knitting machine without the high price tag, and it is a lot smaller than a conventional machine, which makes storing it simple. The Addi is based on loom knitting, and you could call it a loom knitting machine. Even people who only have one arm or arthritis in their hands can also enjoy knitting again using one of the addi Express knitting machine models. To find out more about the machines, and which Addi Knitting Machine will be better for you, simply click on the blue links or on the pictures of the machines. Addi has also recently bought out new and improved versions of their existing machines which I have included below. This is the brand new improved version of the addi Express Professional Knitting Machine with the new and improved mechanical row counter. Knitting is super easy and comfortable with the addiExpress. Quickly knit flat or round – just turn the handle! Even beginners will be able to knit scarves, patchwork, pullovers, and vests, as well as gauntlets for the arms and legs. This machine knits smaller items. The addi-Express Professional features 22 needles, Circular knitted items – Ø 10 to 15 cm (4″ to 6″), Plain knitted items – 15 to 20 cm (6″ to 8″) wide. The Set Contains addiExpress Professional Knitting Machine, Pattern Book, Hook, Replacement Needles 5 Pack, 1 threading tool, 2 stoppers, 4 feet, and 2 clampers. The Pattern Book “Turbo-Knitting 2” contains detailed Instructions and 16 patterns that can be created easily even by non-knitters. The new addiExpress Hook especially well suited for working with the addiExpress machines or for use with complex knitting and crocheting techniques. This is the brand new improved version of the addi King Size Extended Edition that you see below, with a new and improved mechanical row counter. Even more possibilities, even larger knitted pieces, even more, knitting fun with the addi Express Kingsize. With its larger diameter, you can create even more personalized knitted pieces with a few turns of the hand. This machine has 46 needles. The brand new addiExpress Kingsize Pattern Book “Winding instead of Knitting”. The new addiExpress Hook especially well suited for working with the addiExpress machines or for use with complex knitting and crocheting techniques. Made in Germany, so you know its quality workmanship. “I looked at the knitting machine in the box for a while before I attempted to use it. I love to crochet and never wanted to learn how to knit. Since I only know how to crochet, I felt a disadvantage in trying to use the machine and procrastinated. I had to play with the machine for a while to get used to it. I put yarn on and then had to take it off because of either dropped stitches (not the machines fault) or not knowing how to take off the yarn when finished. I now love the machine”. It makes beautiful scarves. I made a scarf for my daughter and she said the scarf looked store bought. I used Lion Brand Scarfie yarn. And then our old favorites – still very popular. 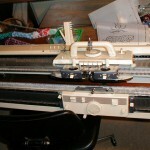 This is the original Addi Express Knitting Machine and is smaller than the king-sized version. It has 22 needles and is great for creating scarves, ponchos, pillow covers and afghans. You can be knitting in minutes on the Addi Express! Just crank and watch your creations grow before your eyes. The Addi-Express Professional knitting machine features 22 needles. Circular knitted items – Ø 10 to 15 cm (4″ to 6″). Plain knitted items – 15 to 20 cm (6″ to 8″) wide. You can use just about all kinds of yarns, but the recommended yarn thickness is 3.5 – 8. Designed and manufactured in Germany to exacting standards and using the finest materials available. All Addi knitting needles are manufactured to exact metric sizes. Please Note: Every Addi product purchased from an authorized Addi Dealer comes with a Lifetime Warranty from any manufacturer’s defect. Average Customer Review: out of 152 customer reviews. Amazon Best Sellers Rank: #32,738 in Home and Kitchen and #36 in Arts, Crafts, and Sewing. This Addi Knitting Machine comes with 46 needles which is more than twice the number of the original Addi Express, allowing for larger knitted pieces and projects. Knit in minutes on the Addi Express; just crank and watch your creations grow before your eyes – simply amazing! Contains 5 replacement pins, 1 threading tool and 4 feel 2 clampers. Designed and built in Germany to exacting standards and using the finest materials available. Lifetime Guarantee from any manufacturer defects. 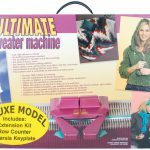 With the king-sized Addi Knitting Machine, you can enjoy making even larger knitted items and thus more possibilities. The Addi-Express “Kingsize” model is mounted on the table and remains securely in position while cranking. This is done with your bare hands, with no need for a power drill set. With the 46 sturdy pins, you will be knitting trendy scarves and wooly hats within a matter of minutes and you will be knitting smart stols and jumpers within a few hours. This is great for anybody who wants to knit for profit or even just knit for family and friends. All of the pins have a number and there is an electronic row counter which enables work to be carried out with precision. The addi Knitting Machine does circular knitting best, but can also make flat panels. There are many books and accessories available to compliment your new Addi Knitting Machine. Please Note: Every Addi product purchased from an Authorized Addi Dealer comes with a Lifetime guarantee from any manufacturer’s defect. Check out the video above to see how you can make a hoodie in 30 minutes or less on the Addi Knitting Machine. Can you make flat panels with the Addi Express King Size Machine? Yes. There is a button near the turn handle. Up is to knit a flat pane. Then you simply knit from white needle to white needle, turning the handle one way. Stop, then turn the handle the opposite way. Go back and forth slowly. You can put your stoppers just before the needles if you want a shorter panel. Continue back and forth until your panel is the required length. Check out the video below for a demo. Can you make different hat sizes with one machine? Yes, any size is possible. Since the Addi can make flat pieces you can piece them together to make the blanket. So the answer is yes. Can you make scarves with the Addi Knitting Machine? Yes, you can, but to me, the flat panel mode sticks entirely too much and continuously drops the stitches. If you were to make one it would be easier to use the circular mode. Is it possible to increase and decrease on these machines? My experience is limited but, no increasing or decreasing in circular knitting mode unless perhaps you somehow drop stitches but from what I’ve done, not a good idea. The number of stitches is constant in the circular mode with this machine. If you are knitting a flat panel, it is not a problem to increase and decrease from the ends of the rows. How do you make different sizes of hats? If you want to make Hats, choose the REGULAR, not the King Size machine. The only way to alter it is to knit with a smaller amount of needles – the regular is perfect for hats – the KING size is better for larger projects, shawls etc, that you knit back and forth with! What do I do to stop my Add Knitting Machine dropping stitches? This happens from time to time, especially at when I start to knit something new. This is a common thing with the Addi, but it is caused due to the fact that the knitting machine doesn’t come with weights as other knitting machines do. Simply purchase some knitting machine weights to hang and the end of your knitting and the problem should be solved. Addi doesn’t make weights for their machines, but any knitting machine weights will work here. My row counter doesn’t seem very accurate. What can I do about this? Unfortunately, this is one of the cons of the machine. The row counter isn’t that accurate. I don’t quite trust it and always do a count myself just to double check. Hopefully, this is a problem that the manufacturers will get to correcting in the future. To see more reviews on the Addi Knitting Machine, you can visit amazon below. For a cheaper option or a kids version of a knitting machine, you can try the Singer Knitting Machine. Other loom knitting machines you may want to check out include the D&D Professional Knitting Machine or even the Prym Knitting Mill. I really enjoyed the informative nature of this page, and truth be told, this makes me consider taking up “cliff notes knitting” on the side so I can sell the products and make some extra money. The addi Knitting Machine seems like a great buy. I am a beginner knitter and this looks like even I will be able to work it. Thanks for stopping by Becca. The beauty of this machine is that even somebody who doesn’t know how to knit by hand will be able to learn how to use the machine, as it is way easier. All the wonderful items you can make on this machine make it well worth its weight in gold. I am thinking of adding my own products to sell on my website and knitted baby clothes is one of them. I have been considering a knitting machine and one of the features I like about the Addi range is the lifetime guarantee. I have a question. Would this product be suitable for a beginner, with enthusiasm, like me? Definitely. Using the Addi is easier than knitting by hand. I had no idea you knit by machine. I have been looking for a present for my Mum for Christmas, as she has recently got back into knitting and knitted my sister a jumper. I think she would love this, as she does question her ability, so this would give her the confidence to do a few more things. And she has 5 grandchildren, so a lot of work to do! Then this would be the ideal gift for her. Well, Michel, I was all set to support you will constructive criticism. But I think your site is great. Content is focused, grammar and spelling great, images great, pleasing appearance and personal connection great. I hope my website will be as good. but does it work with a battery or it is manually wound by us? Keep up the good work in your article! This machine is manual not battery operated. Thanks for the comment Rick. This Addi Knitting Machine sounds very cool, especially when looking at the rate – four out of five start. The videos kinda explains the whole product and it seems so easy to make clothes and stuff with it. I should buy this for my grandmother – she always liked to knit. The customers reviews are very positive, well the product seems to be great! Thanks for the input Alexey. I never knew knitting could be so much fun until I read this article. The great thing I noticed is the idea of review before you buy. It really did what it said and I must say good work,as I am sure the writer really knew what they were doing. This article also gave me idea for a nice knitting gift in this up coming holidays and I am sure more articles like this are coming and will talk more on some of the products reviewed here. Thanks for stopping by to comment Richard, and yes knitting can be a lot of fun, even more so on the addi, as knitting on the addi is easier and quicker than knitting by hand. I’d never heard of the addi knitting machine before reading this, but it looks like quite an amazing little device! After watching the videos on how it’s used, I think it’d be a great tool for those wanting to make their own knitted products to sell. It certainly looks like it would take much less time to finish something compared to hand knitting. I’ve never tried knitting, but I have crocheted in the past and that takes a lot of time by hand…at least for me it did! And, I’m pretty sure knitting by hand would take a long time too and probably not too easy on the hands either. I remember mine would get a bit cramped up if I kept at it for too long. So, I’m thinking this machine would be quite handy to use even for non-knitters like myself. It actually looks like fun to try, especially since it’d be much faster than by hand. I like that you’d actually be able to finish something such as the hat shown in the video in 30 minutes or so. That is quite amazing! I was wondering though, can you use any type of yarn, or do you need to stick to a certain type for it to work? I’ve noticed some yarns are thicker and some are thin, plus some are really soft, sort of fluffy…would those work in this too? Thanks for sharing your review! I learned quite a bit about the Addi Knitting machine…it certainly looks like a wonderful machine to use! Keep up the awesome job and best wishes! Thanks for stopping by Sherry. This machine is easy to use and quick to learn. They say you can use any type of yarn, but I find that the thicker yarns work the best with the addi Knitting Machine. The more expensive knitting machines take the thinner yarns. With the addi, the thinner yarns come out looking almost like lace. But then again the thinner the yarn the longer it will take to knit. The Addi knitting machine looks pretty cool. I’ve always wanting to take up this sort of hobby but I never felt like I was good at it. So interesting though. My sister-in-law LOVES to knit and she would just love this knitting machine. I’m going to send her your way. Thanks so much for sharing. Thanks for stopping by Jen. Hope your sister gets some joy as well from visiting this site. I knit for charity and mostly do hats and scarves and I thank Addi for making this machine everyday. I make sometimes 10 hats in a day and I could never knit that fast. The children that I help are getting nice warm hats and I can help many more children. Today I started hats for our homeless men to give out in the fall. Its strong and really solid ,Thank you Addi. Thanks for stopping by Brenda, and it is great meeting people who work so hard for worthy causes. I salute you. Making 10 hats a day is awesome, and you must know your Addi knitting machine like the back of your hand in order to achieve this. Keep up the wonderful work that you do. Hi, Thanks for your comment and please let me know how it goes with your new Addi Knitting Machine, and if it affects your back at all. I am sure other readers would also love to know. I am interested in using the addi for blankets and socks. Can I use the king size for socks or is it too big? I think the smaller one would be better for socks, although also a bit tricky. I think I have seen a sock knitting machine on the market that you get especially for socks, although it isn’t an Addi. I will try and do some more research on this in a future article. You can, however, use the larger King Size Addi to knit panels to make blankets. Wow that knitting machine is awesome. I love how you had a couple of different videos to show it in use. I was mesmerised by it. It was a really interesting read. And really kept me interested the who way through. Maybe you could put some more visual photos up of different finished products that have been made using the machine. Excellent idea Vanessa. Will look into doing just that. an Addi Knitting machine is certainly something you won’t find at Walmart. You have such unique equipment I can only wish you the best. When you are promoting something this new and exotic you are sure to meet some wonderful people that really need or could help themselves if they had what you had. The site that you have presented is very inviting as well. I know and sadly, I can’t even find it in local craft and knitting stores. As far as I can tell the only way to own an Add Knitting Machine is to order it online. Hey Michel, your post was awesome. Personally, I used to think about taking up knitting and trying to turn a profit with all of the various things that you can create with it. Ultimately, your post got me thinking about trying to possibly look into that again, do you knit and if so, how long have you been doing it? Anyway, your post is awesome and should be shared with the world. Keep on rocking. Thanks for stopping by R.J. I have been knitting on an off since I was five, so I am very comfortable with it now, and still enjoy it. I always have some or other knitting project on the go. There’s a question in the article, can you knit different sized hats? Only if you knit Flat and add a seam, is the answer. The professional produces a tube the size of a sock or mitten, or a hat to fit a premie baby! The king size makes a tube for a hat that would fit up to a 22” head, but without shaping at the top, you just gather it up. Thanks for that Belinda. You are quite right. This is a very informative piece on something I am interested in but know very little about. It is very clear and concise, and I found it very useful. I think this actual knitting machine is much simpler than I am needing, but I can see how it would be the perfect machine for many people. The Addi Knitting Machine is perfect for beginners, and it is quick and easy to learn. A lot of advanced knitters are looking for something a little more challenging like the The Silver Reed Knitting Machine, but in most cases, the Addi satisfies a lot of knitters cravings. I think I just found my wifes Christmas present! She recently took up knitting and can not get enough of it. When she first started it looked so confusing and was time consuming, but now that she is getting the hang of it, it comes along decently fast now. I can only imagine how much this could sped up production and take the stress off of her hands a little. Thank you for all the great information on the Addi Knitting Machine, it has definitely been an eye opener as to what I can get my wife as a gift for almost any occasion! Once again thanks for the great info and I look forward to reading more! Thanks for stopping by Kenny. Mistakes are easily fixed proved you spot them in time. You simply unravel a row or two. It’s pretty quick. You know, I have always admired people who could knit. I tried once, when I was much younger. How hard would it be to learn to knit, using one of those machines? Something to think about. Does it come with really complete instructions? Can someone learn on it if they have never knitted? I certainly think you will find some interested folks; I know a lot of people who like to knit. Good luck to you! The invention of knitting machines means that you don’t have to even know how to knit by hand anymore. They come with complete instructions and you can get going straight away. It’s a lot easier in fact than hand knitting is. The Addi Knitting Machine looks great! I´ve always wanted to learn about knitting and I didn´t know machines like this that make knitting so easy even existed. I remember my grandmother was great at knitting, she even tried to teach me a litle bit but, I think that I forgot how to do it. Do you think that even a complete newbie like me could work easily with this machine? By the way, I really like your site, the theme is pretty nice. The joy of the Addi Knitting machine is that it is based on loom knitting so it is easier to use than it would be learning how to hand knit. Loom knitting Is simply a matter of winding the wool and then pulling the bottom stitch over the top stitch, but with the Addi you turn the handle and this happens automatically. This machine looks really interesting. I’ve never seen this one before. My great-grandmother used a Singer machine and then her daughter, my grandma, had it and now it is my mom’s. She does great stuff with it. I like how it works, as they say – ’old but gold’. This knitting machine you showed really saves time and I think it can be very useful. It looks safe and easy to use, which is definitely a bonus. Maybe someone could start making hats or scarfs and sell them online or in some store. Even though I don’t knit or use this, I’m glad I ran into this article, I will think of people who might find this useful and share it with them. Thanks for stopping by Strahinja. Yes I agree with you that the Addi Knitting Machine will be extremely useful for someone who wants to knit scarves and hats to sell. I’ve heard of the Addi knitting machine, but I’ve learned quite a bit from your article. I didn’t realize they had a large size machine. I only knew about the smaller one. Most interesting is that you can knit flat panels. That is very interesting to me, since it would allow making all kinds of knitted items. And, thank you so much for including the videos. Getting to see the machine in operation really helped me decide that I need to get one. Go for the bigger one if you can, as you can do so much more on it. Thanks for the comment Nancy. Your review was very thorough. I like the way you talked about this Addi Knitting Machine. In fact your review on this machine has made me want to get one for my sister was also likes knitting like yourself. My family is full of creativity. My mother is a seamstress and my father is a tailor. My sister, who follows me loves to knit a lot with her hands. She started it at a very early stage in her life. She used to do knitting work as craft for her school projects. And even sometimes make some nice art work with her hands as gift for her teachers. I really admire the way she is deeply attached to her creativity work. She just love to create with her hands and can do some many things with her knitting. So, I decided to surprise her with a gift of finding a knitting machine for her, just to surprise her. I know she will be very happy to see it especially since will enhance her creativity. So, I’m glad I came across your article in my research on the internet. Once again thanks a lot for your thorough review. Thank you Stephen and I am sure your sister is the ideal candidate to get a knitting machine as a gift. I really enjoyed the video of how to make a hat in 30 minutes or less using the Addi knitting machine. Each of the knitting machine reviews in this article are very thorough and well written. After reading your post it has opened my eyes to the possibilities of not only knitting for profit, but also creating great gifts for friends and family. I have bookmarked your site and going to share your information with many others and decide on which machine is right for me. Let me know what machine you decide on and why. It would be interesting to read about your experience. So which of the two models would you suggest if the focus is primarily on child and adult hats? The original addi Express is great for knitting hats. It is a smaller version of the Kingsized machine and is a lot cheaper, especially if your primary focus is hats.